Are the Flyers really a goon squad? Reading through various discussion boards following the Flyers’ victory in Game 4 of the Eastern Conference Final, I noticed several Penguins fans describing their cross-state rivals as a goon squad led by a dirty 23-year-old center named Mike Richards. Obviously, I have made my thoughts on Richards quite clear, but I found the concept interesting. That the more skilled, talent, gifted Penguins were defeated by a punk team that won’t fight fair. Their argument is easy to assemble. The Pens feature young stars like Crosby, Malkin, Hossa, Staal, Fleury, Whitney, and Malone. Veterans Sykora, Roberts, and Gill add grit and dependable leadership. 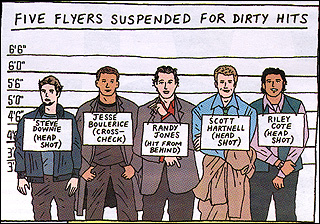 Meanwhile the Flyers really only have one marquis name in Danny Briere, several yappers like Scottie Upshall and Scott Hartnell, and sustained five suspensions during the early portion of the regular season. Such contentions are somewhat one-sided. Let’s not forget that the Pens regularly dress Georges Laraque, the most feared heavyweight fighter currently playing in the NHL. And the Flyers possess much underrated talent in defensemen Kimmo Timonen and Braydon Coburn (and we may add Randy Jones here in the near future) as well as forwards Jeff Carter, Mike Richards, and Joffrey Lupul. But none of that addresses the heart of the matter: is this really a battle between the stars and the goons? I say no. The Pennsylvania Cold War is about two different methods of winning. For Pittsburgh, the game is 100% new NHL with a smattering of 1990s excellence – skill and speed to gain a lead. a strong trap to keep it. For Philadelphia, it’s old time hockey all the way – getting it done with hard work, grit, tenacity, and a huge helping of team defense. To simplify this, it’s Sidney Crosby vs. Mike Richards. Where the Penguins rely on skill to carry them, the Flyers rely on themselves as a team unit. Consider this: despite losing their entire top defense pairing and having a blueline with slow moving gray beards like Hatcher and Smith and unproven youngsters like Jones, Kukkonen, and Parent, the Flyers have not been blown out even once by the Penguins. The largest goal deficit in a single game? Three goals – one of which was an empty netter from Marian Hossa. In a league of superstars, number one draft picks, and trade deadline acquisitions (see entire Penguins roster), the Flyers band together to assemble their wins. It may not be pretty, as in the case of almost every goal Mike Knuble has ever scored (well, except for that wrister he once put past Martin Brodeur). It may involve irritating the opponent, as in the case of the Richards-Crosby scrum in Game 4. And sometimes it requires fireworks, like Jason Smith pummelling Ryan Malone during the regular season or the various exchanges between Laraque and Riley Cote. Only two teams in NHL history have ever recovered from a 3-0 deficit. Some journalists have questioned whether the Flyers can generate the intensity required to win twice in a row. But if there were ever a team with the emotional strength and the ability to perform when the chips are down, it’s this Flyers squad. And if that makes them goons, so be it.